Scientists at Mississippi State University have been working to find an inexpensive, attractive way to keep the sand on the 26 miles of manmade beach between Biloxi and Pass Christian, and Hurricane Isaac tested their experimental site. As the researchers expected, all of the vegetation at the site is still intact and will regenerate. The sea oats that created the foredunes, or the line of sand dunes closest to the water, were flattened by the storm surge but not destroyed. 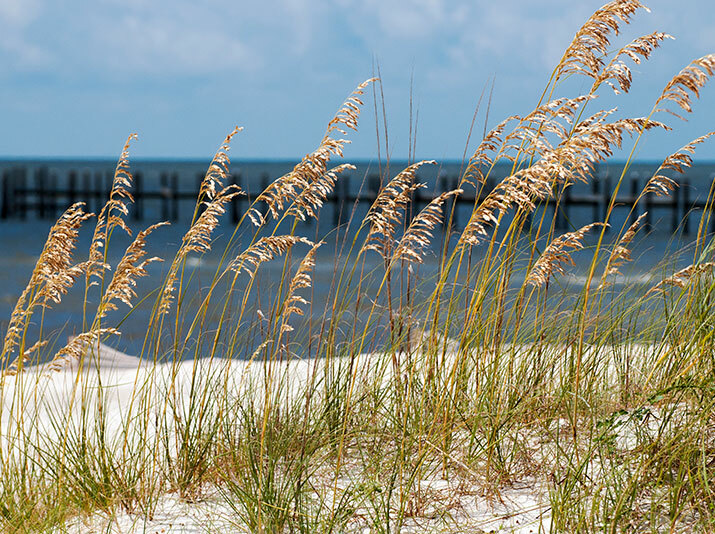 "The foredunes took the brunt of the hurricane’s storm surge, but root and stem parts of the sea oats were still embedded in the beach from when they were originally planted in July 2009. They will grow back and recreate the dunes," said Pete Melby, a professor in MSU’s Department of Landscape Architecture. "One of the purposes of sand dunes is to serve as a sacrificial formation to protect the mainland from tropical storm wave erosion." The dunes on the upper beach were largely intact, with some erosion at their southernmost edge, Melby said. Most encouraging was that the one-year-old salt marsh was unaffected by the storm. "We were elated to see that the salt marsh had survived the storm," Melby said. "That is a big deal because once the marsh is established, it is very beneficial to the rest of the beach." "The root structure of salt marsh grasses is 90 percent of the plant’s biomass, and one of its main purposes is to protect the beach edge from erosion. The marsh creates much more stability for the beach and contributes to the overall health of the water’s ecosystem," he said. Mississippi’s Gulf Coast has faced the challenge of keeping sand on the beach for decades. "The erosion of the beach since its creation in the 1950s has been relentless. Stopping it is beyond the capacity of individual cities," said Thomas Cathcart, agricultural and biological engineering professor and Mississippi Agricultural and Forestry Experiment Station researcher. "All cities can do is replenish the beach using dredged sand, and that costs about $9 million each time." Since 1995, Cathcart and Melby have researched a sustainable landscape system designed to hold beach sand in place, reducing the frequency with which it has to be replaced. The sand protects Highway 90, which runs parallel to the beach, and the residential and commercial areas on the north side of it. At the experimental site —a 3-mile stretch of land donated by Harrison County to the Biloxi Bay Chamber of Commerce—Cathcart and Melby planted native grasses, shrubs and trees on the upper and mid portions of the beach that are adapted to the environment. "Compared to the conventionally managed site, the experimental site has experienced much less wind and rain erosion," Cathcart said. "The plants effectively create a natural sand dune by catching the windblown sand before it reaches the road. Before Hurricane Isaac, the dunes had grown to become the highest point between Biloxi and Pass Christian. Before planting it was the topographical low point. Over time the dunes naturally will rebuild." Cathcart and Melby estimate the dunes will reestablish themselves within two to three years. Melby said the experimental site will now be referred to as the sustainable beach because of the landscaping’s success at withstanding Isaac’s storm surge. "This is a system that will work," Melby said. "It will save money on highway sand clean-ups and on replenishment. It will also be better for the Mississippi Sound and its sea life."